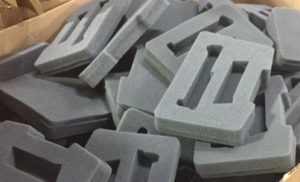 Foamtech fabricates many different types of foams including polyurethane, polyethylene and cross-linked. We specialize in custom fabrication requirements for the consumer and industrial industries including packaging, sports, medical and furniture markets. We have the ability to custom cut, die cut, contour/profile cut, convolute and laminate foam. 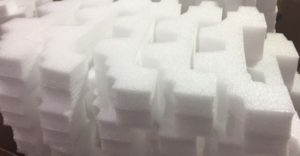 We have state of the art equipment that can produce any sized foam no matter how small or large the product or the quantity. We inventory foams with both open and closed cells in a wide range of densities. We also have a keen understanding of the ESD market and carry anti-static foam as well as our proprietary conductive foam.